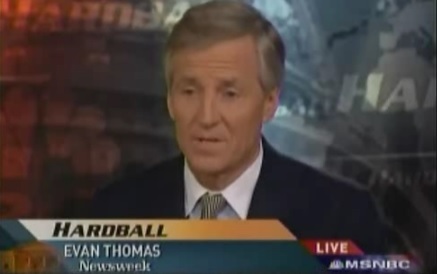 Thomas, appearing on Hardball with Chris Matthews, was reacting to a preceding monologue in which Matthews praised Obama’s speech: "I think the President's speech yesterday was the reason we Americans elected him. It was grand. It was positive. Hopeful...But what I liked about the President's speech in Cairo was that it showed a complete humility...The question now is whether the President we elected and spoke for us so grandly yesterday can carry out the great vision he gave us and to the world." Matthews discussed Obama’s upcoming speech marking the 65th anniversary of D-Day and compared it to that of Ronald Reagan. He then turned to Thomas and asked: "Reagan and World War II and the sense of us as the good guys in the world, how are we doing?" Thomas replied: "Well, we were the good guys in 1984, it felt that way. It hasn't felt that way in recent years. So Obama’s had, really, a different task We're seen too often as the bad guys. And he – he has a very different job from – Reagan was all about America, and you talked about it. Obama is ‘we are above that now.’ We're not just parochial, we're not just chauvinistic, we're not just provincial." Thomas elaborated on Obama as God, patronizingly explaining: "He's going to bring all different sides together...Obama is trying to sort of tamper everything down. He doesn't even use the word terror. He uses extremism. He's all about let us reason together...He's the teacher. He is going to say, ‘now, children, stop fighting and quarreling with each other.’ And he has a kind of a moral authority that he – he can – he can do that." In response, Matthews wondered: "If there's a world election between him and Osama Bin Laden, he's running a good campaign." Thomas agreed: "Yes, he is." CHRIS MATTHEWS: Tomorrow on the 65th anniversary of D-day, President Obama has a tough pair of acts to follow. His own speech yesterday and one given a quarter century ago. I remember getting up that morning in 1984 to catch President Reagan at Normandy. It was a real ‘Morning in America’ speech. I believe that Reagan’s ability to connect to World War II was a reason for his enormous popularity in this country. Here he was on the bluffs of France saying something very good about America, how we liberated Europe. That's the heart of it, really. The reason Reagan was popular, Roosevelt was popular, Jack Kennedy was popular, and Barack Obama is popular. Don't tear us down. Don't make us feel like victims or the angry guys or the worried guys. Make us feel American. I think the President's speech yesterday was the reason we Americans elected him. It was grand. It was positive. Hopeful. It said to the world, if you're a good guy, you've got nothing to fear from us. If you’ve got national aspirations, if you want to be respected as a people, if you want to be treated as an equal people in the world, we're on your side. If you're an aggressor, if you want to hold down other people, if you're driven by a predatory ideology, if you're out to hurt this country, look out. We Americans are that rattlesnake on that first flag, ‘Don't tread on me.’ But what I liked about the President's speech in Cairo was that it showed a complete humility. What he did was rob from the enemy, those who want to destroy us, their main case, the belief that only by extremism can the East reach equality of dignity with the West. The question now is whether the President we elected and spoke for us so grandly yesterday can carry out the great vision he gave us and to the world. If he can, he'll be honoring what happened on D-day 65 years ago tomorrow. He will be delivering the world once again from evil. Evan Thomas is editor at large for Newsweek magazine. Evan, you remember '84. It wasn't 100 years ago. Reagan and World War II and the sense of us as the good guys in the world, how are we doing? MATTHEWS: Can he – well, here’s Ronald Reagan. Let's take a look, a little Friday night nostalgia. Here he is speaking about peace and reconciliation at Normandy back 25 years ago. Let's listen. RONALD REAGAN: But we try always to be prepared for peace, prepared to deter aggression, prepared to negotiate the reduction of arms, and, yes, prepared to reach out again in the spirit of reconciliation. In truth, there is no reconciliation we would welcome more than a reconciliation with the Soviet Union so together we can lessen the risks of war now and forever. MATTHEWS: Let's talk about the difference. He was talking about the evil empire, trying to reconcile with the people of Russia and the Soviet Union, but not the country. Barack Obama the other day was saying, yesterday, that we don't have an enemy out there per se. We have people who choose extremism, but Islam’s not our enemy. That's not the evil empire. THOMAS: But Reagan did it with a very – for the first term it was a clenched fist. I mean, we ramped up the cold war before we ramped it down. We built up our military. We – all of this D-day stuff was about war. That was about fighting. MATTHEWS: What's his shtick? Reagan had the United States arms race, winning the arms race. And we had the threat of high frontier, we were going to beat the Soviets at technology. MATTHEWS: If there's a world election between him and Osama Bin Laden, he's running a good campaign.